Dortmund - Sven Bender, Sebastian Kehl, Ilkay Gündogan, Moritz Leitner and now Nuri Sahin. The central midfield options at reigning champions Borussia Dortmund have become even more of a luxury after the sensational return of their prodigal son last week. Having a Turkish international, Bundesliga champion and the German top flight’s youngest-ever debutant and scorer in tow certainly adds to the list of options head coach Jürgen Klopp can choose from. However, with so much competition for places in the team, where will new arrival Sahin fit in and just how acute will Klopp's selection headache now be? Before Sahin's arrival, Klopp had four recognised central midfielders to choose from all of whom have made important contributions. Kehl has featured in eleven league games this season and remains an important cog in the BVB wheel at the age of 32; Bender, whose appearances have been restricted, covers more ground than anyone; and 20-year-old Leitner is improving with every passing opportunity. Yet Kehl is slowly approaching the end of his career, injuries have prevented Bender from rediscovering his best form and Leitner is not quite the finished article. Of all four of them, the most impressive has undoubtedly been Gündogan. Since establishing himself in the first team at the start of last season’s Rückrunde, he has been one of Klopp’s most reliable performers, in terms of both fitness and form. Brought in initially to fill the gap left by Sahin's departure to Real Madrid, the German international covers ground, tackles adeptly, has an enviable eye for a pass and occasionally provides a threat in the opposition's box. However, the arrival of Sahin now ironically could mean that Gündogan, despite earning Klopp's unwavering confidence, is the player whose position is most under threat. His role in the team was modelled on Sahin in terms of keeping possession ticking over and orchestrating BVB's attacking movements with one of Bender or Kehl assuming the defensive responsibility. Klopp would be reluctant to sacrifice the cover afforded to him by Kehl or Bender, which he would have to do were he to pair Gündogan and Sahin together in his current system. Ideally, the two holding midfielders shouldn't boast similar strengths as proven by a home tie against Fortuna Düsseldorf when Kehl and Bender played together, and the team were held to an uninspiring 1-1 draw. By the same token, playing Sahin with Gündogan wouldn't be the best combination for Klopp either, as the line-up would lack defensive cover in midfield. Klopp prefers to have a balance between defensive steel - provided by either Kehl or Bender - and the passing quality in attack, provided now by Gündogan, but formerly by Sahin. Another possible way to accommodate Sahin would be for the team to adopt a 4-3-3 formation instead of the 4-2-3-1 that Klopp prefers. In this way, Gündogan and one of Bender or Kehl could continue to focus on the protecting the backline, with Sahin adding a new dynamic to the central midfield trio. This would retain the defensive element of Dortmund’s game whilst also accommodating the lock-picking qualities of Sahin in a more advanced role, leaving Gündogan available to assist in both defence and going forward. The forward positions would then be filled by Marco Reus and Mario Götze, with Robert Lewandowski as the lone striker. However, potentially problematic would be the fact that the energy of one or both of Kevin Großkreutz and Jakub ‘Kuba’ Blaszczykowski, whose work ethic without the ball is unparalled, would be sacrificed. In their absence, more defensive responsibility would fall on the shoulders of wide-men Reus and Götze, which isn’t their forte and would inevitably detract from their attacking qualities. Ultimately, changing his entire formation - an idea that was attempted with disastrous results in the 2-1 home defeat to Ruhr rivals FC Schalke 04 not so long ago - would not be a road that Klopp would be willing to go down. It rather seems, then, in the long term, Sahin will be competing directly with Gündogan for a place in midfield. In the short term, though, the latter has been in imperious form, especially in the Champions League, and looks likely to keep his place in the team. 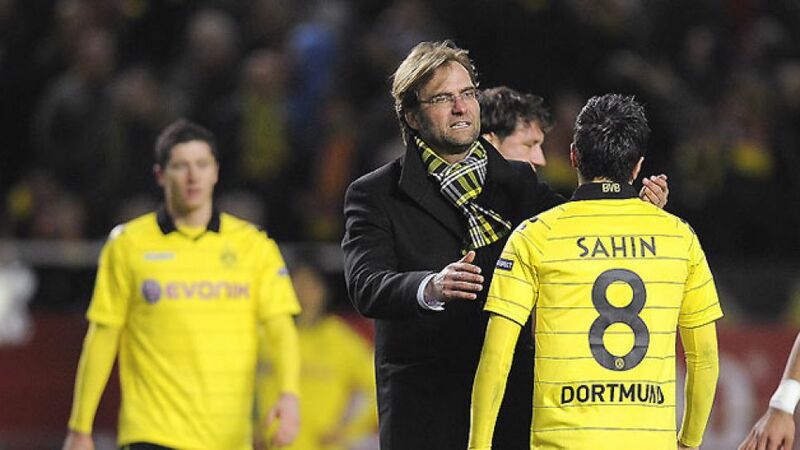 Indeed, in the eighteen months Sahin has been away, Dortmund's style of play has taken on a whole new dimension. Adapting to the break-neck pressing tactics that they now employ, in Europe especially, would be demanding a lot of a player who has played in just 18 competitive games in one-and-a-half seasons. What is clear is that however difficult it may be to accommodate Sahin, his presence in the squad means that Klopp has even more quality to choose from, and with the team competing in three competitions, rotation will most certainly be needed. The Yellow Blacks lost two and drew one of their six games following European exertions, suggesting that strength in depth is exactly what they need. The fact, then, that Sahin, adored by the fans, cup-tied in Europe and BVB through-and-through, provides that aforementioned luxury, is a big bonus for Borussia Dortmund.